When Georgia State football recruits visit Atlanta with their minds filled with dreams of NCAA or NFL stardom, the Panthers’ new digs just south of downtown might convince them to stay. And for the top high school players who will play in the facility in just two weeks, it will be flat-out cool to play a football game where they watched so many Braves baseball games growing up. Panthers staff, players and fans—as well as high school football fans—will not have to wait long to see an official game played in Georgia State Stadium. On Aug. 18 and 19, the MetroPCS Corky Kell Classic will take up residence for two days, bringing 14 of the best teams in the state to compete in seven games, two on Friday and five on Saturday, to officially kick off the 2017 high school football season. 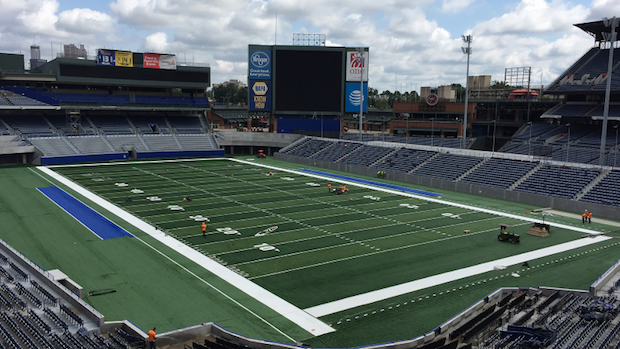 Thus far, Georgia State has completed the first phase of an extensive overhaul of the former Turner Field. It will sport the name Georgia State Stadium for now, with plans to name the stadium and field separately later. The Georgia State football program is in its eighth season and has spent the first seven at the recently vacated Georgia Dome. The new stadium is not the only change for the team this season. Shawn Elliott is in his first year at the helm and feels the new facility will impact the program in multiple ways. In total, nearly $30 million has been spent to transform and retrofit The Ted to host college football. The dugouts have been removed, and the grass has been dug up and replaced with a turf field. A new grandstand fills the void between the football field and what was the right field fence, just below the former Chop House and the 755 Club, which have been renamed. The State House Grill and University Club, respectively, will now serve students, fans and families enjoying GSU games. The old home plate would now be in a corner of the south end zone, and seven rows of seating have been removed to allow for ideal football sight lines. Tens of thousands of seats remain up top for the time being, a reminder of Braves games past. The color of the seats, a Braves blue, is a fitting coincidence for the blue-clad Georgia State Panthers. The Corky Kell Classic reached a deal with Georgia State back in April to replace the Classic’s longtime home of the Dome, which is scheduled to be demolished in November. For more information on this year’s MetroPCS Corky Kell Classic, visit www.corkykell.com; for tickets, visit the event page on GoFan.